To submit content send an email to one of the contacts listed to the right. We are always looking for useful and interesting articles. Group Mailing list will keep you posted on meeting topics and on information that people have found in their GNU/Linux adventures. Austin Linux Enthusiasts is about a dozen Linux Enthusiasts who meet every Wednesday night, from 8:00 pm to 12:00 pm (come as early or as late as you like), at ATX Hackerspace, a collaborative industrial workshop. Read the info at the Wiki link above to learn more about this organization. 06/2014 :: "2014 Texas Linux Fest"
"PS: Elrod will be there..."
Our goal is helping and teaching people about GNU/Linux,	and often computers in general. You can come to a meeting and try out GNU/Linux on some of our computers, or you can bring your own computer. ALEians (as we call ourselves) bring computers to the meeting regularly; we have power cords and (wired/wireless) internet connections available. 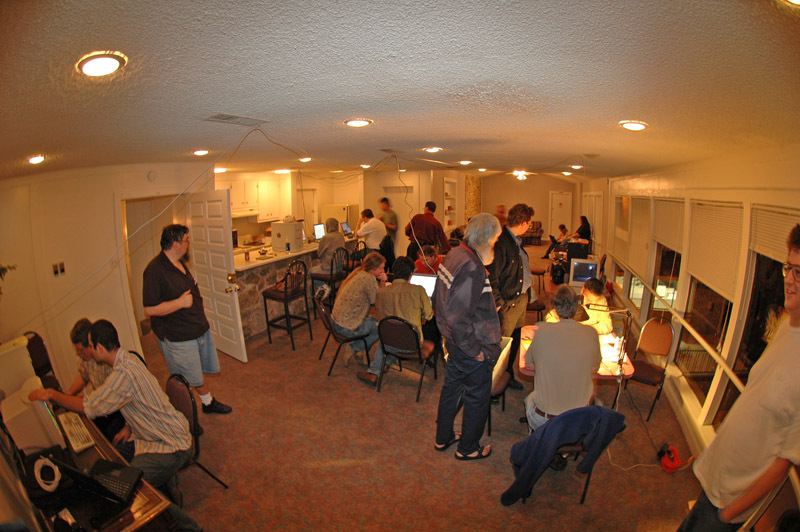 Other Linux user groups in Austin have good "lecture and discussion" type meetings, but our group is different in that we provide hands-on tutorial style help, and tinker together. And yes we are newbie friendly, so bring your laptops / desktops or just come as you are and we'll help you get started. Our general format is to announce a particular topic on	the mailing list , and sometimes have a short (15 to 45 minute) talk on it, followed by trying things out. If you have specific questions about GNU/Linux, please feel free to ask. There are usually plenty of us who are willing to share information. People are encouraged to join in on any “discussions” and participate in whatever way they feel comfortable. Drinks and snacks are available for purchase during the meeting. If you are interested in the group, all you have to do is show up. There are no dues to pay. If you join our mailing list you will be able to ask questions and be notified should a meeting be canceled. To join the group without going to the web page, send email to this address. The current points of contact for this web page are Les and Rob, but it's probably better to simply join the yahoo group listed above and send email to that list.